This PBS web site is designed to help high school students develop foundational knowledge of economics through problem solving, analyzing data and opinions, communicating ideas, demonstrating understanding, and acting on what they have learned in authentic ways. The American Bankruptcy Institute (ABI) is the largest non-partisan organization dedicated to research and education on matters related to insolvency. View and print your credit report (not score) yearly for free. "Apply for a Classroom Grant- 100% For Kids"
In late 2002, Utah’s credit unions joined forces to created 100% for Kids: Utah’s Credit Union Education Foundation. The foundation is funded primarily by donations made by Utah’s credit unions and their members. Since 2002, the foundation has funded more than $5 million worth of grants for Utah’s public schools. Public school teachers in Utah can apply for grants. Grants can range from small, to purchase basic classroom supplies, to major, to fund large school-wide projects. The application process is simple, and can be completed online or on paper. For more information, visit the foundation’s website, or e-mail the foundation’s Director, Liz White. Merge classroom learning with real-world experience as students learn to make wise spending decisions. Banzai is a web-based tool that is free for you and your students! Great college planning resources to share with students and thier families. Look for "For Educations" link. BizKid$ is a public television series that has a website available to students, teachers and parents to participate in online activities engaging them in money management and business. Highlighted are videos of real kid-entrepreneurs who have implemented this program in their lives. Additional links are provided to encourage kids to seek out other opportunities to encourage habits of good money management. Games, budgeting worksheets and credit calculators are given as well to have students think about saving and investing. The BizWorld Foundation offers curriculum that teaches the basics of entrepreneurship, business and finance by showing children how the entrepreneurial cycle operates in the friendship bracelet industry. This is a project-based program that is also aligned to the Common Core standards. This site provides very specific career information based on region. Education requirements, video clips, future outlook, and other specifics of common and unique careers are available as well. Helping turn high school students into savvy consumers without putting them to sleep. We provide unique tools to help educators effectively teach students the basics of personal finance. Using methods that are both entertaining and engaging, our curriculum provides the next generation a solid foundation on which they can build their financial future. A Thinkfinity resource created by the National Council on Economic Education. In this special collection, you'll find advice on how to talk to your students and ideas on how to incorporate this topic into your curriculum. EverFi – Financial Literacy platform for high school is a free online learning tool that helps address the critical issue of Personal Finance with your students. This course consists of ten 30-45 minute modules that cover topics such as budgeting, credit scores, student loans, mortgages, taxes, and investing. The platform places students in a virtual environment to simulate the difficult real-life choices they will be faced with. It also tracks knowledge gain, provides teachers with detailed progress reports and adapts to student's individualize instruction. EverFi Vault - Elementary Understanding Money is our interactive, new media platform designed specifically to introduce financial literacy skills early in a child's cognitive development and empower children to cultivate good financial habits that will stay with them throughout their lives. Help make it easier for students to get money for higher education. Fun interactive website based on savings. Gives tips, challenges, and video links to TV ads. FT.com delivers in-depth global news and financial information, as it happens. The FoolProof Financial Literacy Curriculum is a highly interactive, self-grading group of online lessons called "modules. The modules teach young people about money, financial responsibility and the realities of the free enterprise system. The FoolProof modules take the average student about twenty-two 45-minute classroom sessions to complete. There are a total of 18 different modules. You can use one, or all. Simulation to learn how the stock market works and engage in a virtual sotck exchange. Teaches teens and young adults the importance of insurance coverage to further prepare them for life's journey. No registration needed! Just print and go! The Math Worksheet Wizard is a FREE resource for teachers and homeschooling moms and dads. You can make an unlimited number of printable math worksheets for children, for the classroom or for homework, simply by clicking a button. What makes this site unique is that every time you create a worksheet, you get different, randomly generated problems. Description from website: "Money Habitudes is a game-like toolkit in the form of a deck of cards. The simple but effective tool is used as a conversation starter, an ice breaker, a money personality test, and a stand-alone activity or a module as part of other programs or in counseling sessions." Money Talks for Teens is a bilingual (English/Spanish) money management curriculum aimed at teens 14-18 years old and the adults who work with them. Get your FICO credit score FREE! The National Endowment for Financial Education® (NEFE®) is the only private, nonprofit, national foundation wholly dedicated to improving the financial well-being of all Americans. Kids spend time online: chatting with friends, sharing photos, doing homework. The internet offers a world of opportunities, but there are risks, too. Free and easy online calculators and financial tools. If you are tired of getting credit card applications, visit this site to remove your contact information from "THE LIST!" World Clock showing birth and death rates, plus oil usage. Create your own crossword and word search puzzle for any subject using this free website. SmartStocks.com provides a live stock game using real stock quotes. Learn how to trade online and invest in the stock market without risking your hard earned money. Help your students learn about the stock market by giving them the opportunity to invest a hypothetical $100,000 in a real-time portfolio. This website has tons of free printable worksheets for Math & English Language Arts. Organization and planning materials are available to teachers needing extra tools to succeed. Free crafty puzzles & brainteasers can be used to enhance learning as well. Information about personal bankruptcy from the Money Management web site. Core standards for the General Financial Literacy class. Test your skills running a business in this ultimate business simulation! As CEO, you will match wits in the competitive, technologically advanced industry of the Holo-Generator. This online resource will help students and their families select a college, apply for admission, and plan to finance higher education. Virtual Stock Exchange is a free stock market game from MarketWatch. Investment simulation for students to learn how to "invest in the best stocks" and get educated on the stock market in a fun and simple way. Each lesson plan flows in a way that builds in multimedia content from PBS partners and follows a framework in which students access economic information, process and analyze what they learn, and then act on it in authentic ways. A personal finance education resource which presents an overview of personal wealth-building strategies that includes setting financial goals, budgeting, saving and investing, managing debt, and understanding credit reports and credit scores. Educators can download FREE financial literacy materials -- but a registration is required. Financial topics include: Setting Financial Goals, Spending Plans, Organizing Personal & Financial Records, Checking Accounts, Debt Management, Credit Report. This resource provides excellent lesson plans for grades K-3, 5-7, 8-10, and create-your-own puzzles. A great supplemental resource that supports a variety of programs. The website provides: an economics theme unit, money worksheets, advertising and consumer economics, personal finance lessons, macroeconomics, and create-your-own puzzles. FEFE provides free curriculum materials to help educators effectively teach family economics and finance to their students. A complete personal finance program on DVD for high school teachers and their students. USBE approved lessons on the Utah Education Network's web site. Wells Fargo Bank created this extensive resource for kids, teens, high school students and adults. It also includes a Teacher's Guide. Jump$tart is a national coalition of organizations dedicated to improving the financial literacy of kindergarten through college-age youth by providing advocacy, research, standards and educational resources. The Utah Jump$tart Coalition is comprised of over 50 organizations, government agencies, financial institutions, and corporations. Working together they are able to join forces to improve the personal financial literacy of Utah's youth. A FREE resource for unlimited number of printable math worksheets. Every time you create a worksheet, you get different, randomly generated problems. Printable Money pages to color for grades K-4. A four-lesson curriculum supplement that addresses 7-9 grade mathematical concepts using real-world financial scenarios. The National Endowment for Financial Education (NEFE) provides a wealth of information and resources to help you teach your students how to get from "here" to "there" financially. Ready-to-use Lesson Plans, student resources, book wizard for grades K-10. This great resource teaches students, parents, and teachers about financial literacy and entrepreneurship with free activities for the classroom. Many webisodes are available with fun, interactive activities to accompany each one. 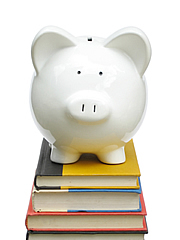 Basic skills in Personal finance lesson plans for Grades 1-5. Financial education from American Century Investments ® is our way of using our expertise in money management to help parents and educators influence the behaviors of children and young adults so they can establish a path towards financial independence. These online tutors will help you understand all the details of writing checks, reading bank statements, reviewing credit reports and more. This is a fabulous tool for setting up and maintaining a budget. This Web site houses several interactive tools and resources for educators, students and parents. What’s that word? This is a quick game where you make a word scramble or word search of financial & economic terms. These games can be played online or printed. Research suggests that educators should use findings in psychology and behavioral economics to enhance youth personal financial instruction. Stanford University psychology researcher Michael Mischel demonstrates how important self-discipline is to lifelong success.